Chanute Kansas is a small town with a population of about 9,000. Unlike many small Americans towns though, Chanute boasts an independent fiber broadband network that currently serves local government and civic buildings. They plan to expand that network to offer inexpensive gigabit fiber connections to every home and business in the area. The city plans to fund the rollout with a bond initiative, but according to Kansas law, they need permission from the state before they can secure the funding. While competitive low-cost Internet service may be great news for residents, but not such great news for the local ISP AT&T, which petitioned the court and won the right to “intervene” in the process. While that seems like mostly harmless legal jargon, AT&T’s move comes at a time when their behavior has been anything but. AT&T has a well-documented history of vocal opposition to the suggestion of municipal broadband projects. The company has worked tirelessly and spent money on lobbyists to enact state laws that aim to prohibit public broadband expansion. 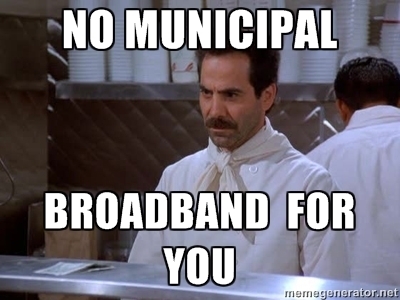 Historically, they have favored the argument that not only should municipally owned fiber projects be banned any place that they (or another company) already services, but also wants those projects to be banned anywhere they might choose to do business in the future. Meanwhile, officials in Chanute remain optimistic, “We are not expecting any issues,” Chanute’s utility director said.